Trains Today: The wrong blue blues? For fans of heritages AC traction there has been cause to celebrate recently. The AC Logo Group (ACLG), owners of many heritage electrics including 86101 and 87002 have secured a main line contract for several of their locomotives. Until GBRf can secure enough class 92's for the Serco Caledonian Sleeper contract they are to hire in locos from the ACLG to work the empty stock moves for the sleeper trains in London. This will be a great source of income for the preservation group and means investment in it's locomotives- plus a re-paint into 'Caledonian Blue'. It is the re-paint which seems to be causing some controversy with some enthusiasts up in arms that these locomotives are being painted out of their traditional BR blue livery- after all- the are preserved. People need to keep an open mind about these developments and view them as just another stage in the locomotive's life. In the fullness of time it is very likely that these locos will return to their much loved BR blue- but for now they will wear the colours of their new operator. An operator who is paying for their use, thus securing their future as well as further progressing the restoration of other members of the ACLG fleet such as the unique class 89. The enthusiast community should be commending the ACLG for securing this work, which represents a fantastic opportunity for these locomotives. I for one am certainly looking forward to seeing them on the blocks at Euston with the sleeper- whichever shade of blue they happen to carry! 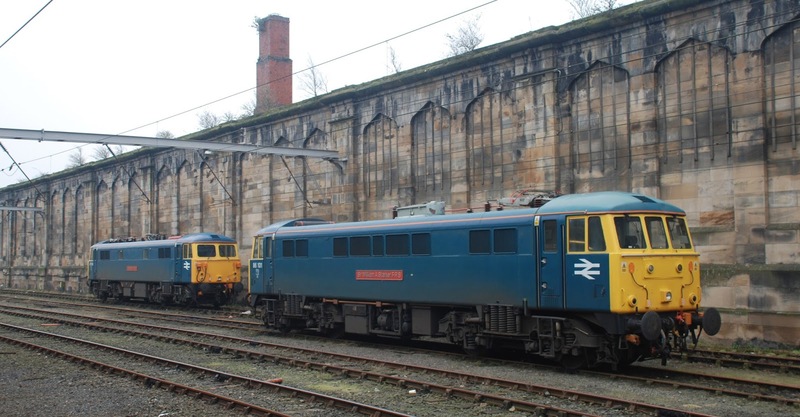 86401 are to be revived to haul empty stock movements for the new Caledonian Sleeper franchise. I expect they'll get far better quality coats of professional paint preparation and protection than any preservation group can apply, plus they're generating funds for their ongoing upkeep, plus they'll be upgraded/maintained to mainline standard, plus a final repaint into BR blue could be stipulated in the contract upon termination. What's not to like!